Early experience and hurt lodged in the primitive brain produce out-dated response habits in adults and children when under stress. – So begins the latest book by the bestselling author, Annie Brook. Birth’s Hidden Legacy will take you on a journey of discovery. Discovery of the hidden forces that shape your life. Discovery of of the hidden forces that shape the lives of your clients. Adults have been these infants, and that heartsong should stay alive in us all. Is yours alive? Or, has it been buried under self-attack thinking, reactivity, numbing out, anxiety, or depression? Learn why you do certain things even when it causes trouble, and what you can do about it. Awaken that feeling in your heart. Bring love and compassion back into your life. Help your nervous system metabolize pain and ease the self-attack of troublesome behavior. Understand your origins of pain, and what you can do about it! Somatic Psychologist Annie Brook helps infants, children, and adults learnt to reconnect through the heart, and repair interrupted bonding and release internalized fear. Her clear writing tracks the primitive brain and life experience of infants and shows how pre-cognitive experience fuels maladaptive behavior patterns in children, couples, and individuals. Ten case studies and named themes from infant experience provide therapists and parents with new options to relieve entrenched behavior responses. 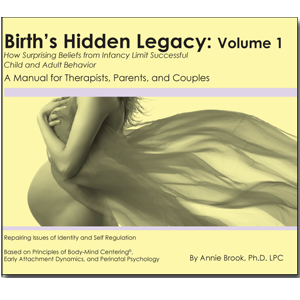 Volume 1 (204 Pages) maps the prenatal, birth, and post-birth impressions that affect behavior and identity. It includes Ten Case Studies which clarify and highlight treatment methods. Individually these books are $28.00 each, buy both for only just $52. Written in plain english, this significant work helps infant mental health specialists, child psychologists, and psychotherapists provide better treatment for clients. A must read for those working with development, personal narrative, and clinical theory. Do you have clients that never change? Are you frustrated with your treatment methods or feel bored. You are not a bad therapist, and they are not bad clients, but it may be that you are not getting to the earliest root of their problems. Relieve their encoded fear related to birth experiences. Change the primitive brain in order to change behavior. Get to the root of protective mechanisms, dismantle anxiety, rage, and fear, and bring life to depression. Empower clients with home practice skills. Teach parents to support their children to process information for success in social play and learning. Are you confused by your child’s behaviors? Do they over-react to situations? You are likely a good enough parent, yet frustrated by these irrational responses. Knowing how difficult birth or pregnancy creates infant fear and need to control will help you. Written in plain english with case studies, this book will help you understand your child and guide them when stressed. Be a smart parent or therapist. Order today.